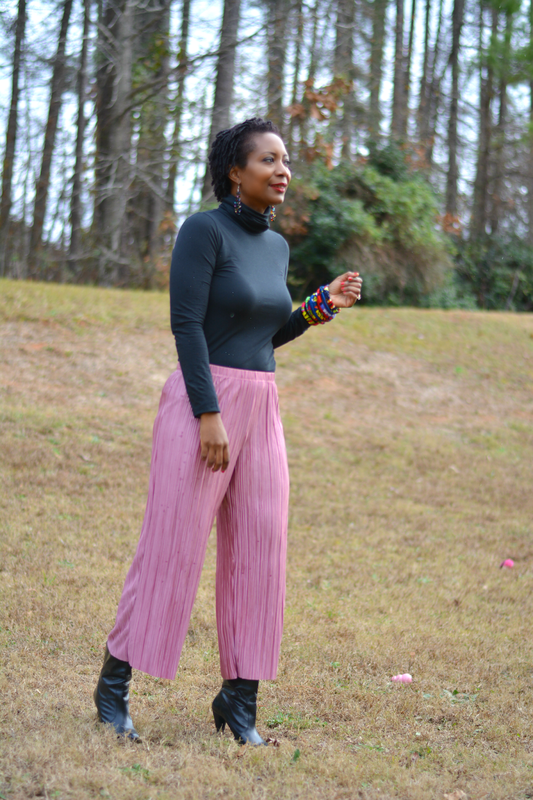 A black turtleneck can winterize any outfit even shell pink culottes. It provides full coverage all the way up to the neck thereby creating a nice packed in heat. My pants are on the lighter side and quite breezy but on a mild winter day, I'm feeling quite comfortable. I mentioned my love of black turtlenecks in my last thrift haul video. Without long hair, I've found turtlenecks to be the perfect basic wardrobe piece. It's simple and stretchy and goes with everything. They're nice to have when you thrift a bunch of colorful print pants and skirts. I wouldn't necessarily go to the thrift store in search of turtlenecks but this one found me. Black clothing at the thrift can be pretty sketch. Fading happens a lot. This one was in great condition so I had to have it. My other black turtleneck needs a break once in a while. I woke up today and decided to dress in something different from my mom outfit. I've been in hibernation mode and have pretty much lived in the same sweatshirt and jeans for an entire week. Today, I wanted a change and pink culottes were the right choice. I like that these pants can be dressed up and dressed down AND worn year-round. If I had wanted to live one more day in my sweatshirt, it totally would have worked with these pants. If temps dip low, I can add tight underneath for an additional layer. These culottes are silky and pajama pant like with an elastic waistband so I can easily transition from outside clothes to indoor couch surfing wear. I'm not going anywhere special so I threw on basic black boots to go with the classic style of the turtleneck. 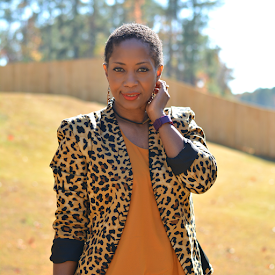 I added some color additions with my newest set of african print bracelets. They add a nice color injection to the outfit. My life right now is soaking up the holiday season with Christmas movies and warm drinks so shiny pants and vibrant accessories aren't a must but it's nice to break out of the dowdy clothes. I like that I'm pulled together for outdoors and still maintaining the cozy for when I come in out of this rain and head back indoors to the comfort and joy.